Help stop Library@URS desk hogging! 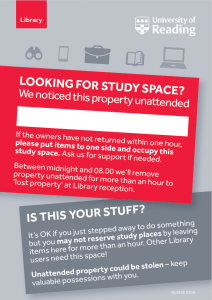 If you find unattended study places apparently ‘booked’ with clothes, stationery and the like, please ask Library staff for support at either the URS Reception desk by the main entrance or the URS Information Desk next to the Course Collection on the ground floor. We will give you a timed warning card you can place on the abandoned stuff. Put the belongings to one side and sit down. If the owner returns within the hour, they are entitled to the space back. If not, you can sit there. Also ask staff to help explain, should anyone returning after an hour complain. Sue Egleton, Head of Systems and User Services.